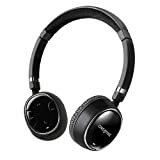 Amazon has the creative WP-350 wireless bluetooth headphones with invisible mic for $59 with free shipping. Sells for $59+ Highest Price. Deals for $49 Lowest Price. Normally $57+.